Speed up your staining protocol. Directly conjugated antibodies already have the Alexa Fluor® dye, fluorescent protein or enzyme attached, so the secondary antibody staining step can be skipped. Easily design multicolor experiments. No need to find primary antibodies from different host species. Directly conjugated antibodies enable the side-step secondary antibody cross-reactivity. Immunohistochemistry of formalin-fixed paraffin-embedded rat cerebellum tissue sections stained with anti-NeuN [EPR12763] – neuronal marker (Alexa Fluor® 647) (ab190565). 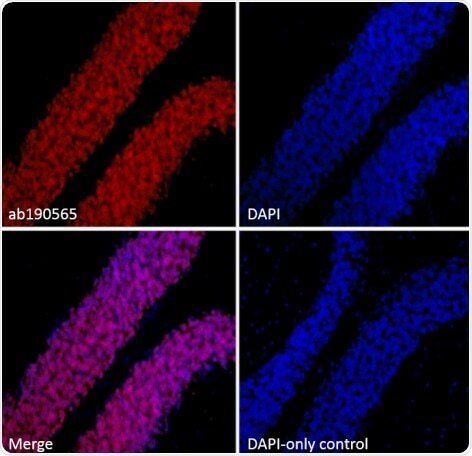 DAPI-only control is from another section and controls for tissue autofluorescence. CD11b FITC, PE, biotin, APC. Click here to view whole range. Abcam is a global life sciences company providing highly validated antibodies and other binders and assays to the research and clinical communities to help advance the understanding of biology and causes of disease. Abcam’s mission is to serve life scientists to help them achieve their mission faster by listening to their needs, continuously innovating and improving and by giving them the tools, data and experience they want. Abcam’s ambition is to become the most influential life science company for researchers worldwide.